SharePoint 2010 has updated some of its timer job features (see http://pathikhrawal.wordpress.com/2010/08/21/enhancement-in-timer-jobs-in-sharepoint-2010/). Now SPJobDefinition offers an UpdateProgress Method, to show the status of the timer job in a status bar. To check the status of a timer job go to "Central Administration > Monitoring > Check Job Status". The following code snipplet is an example of how you could use this method. The job reads a rss feed and uploads some pdf files into a document library. The progress bar is updated by each uploaded file. The snipplet is not complete, because of copyright. I commented out some regions but you can see how you could use the updateprogress function. 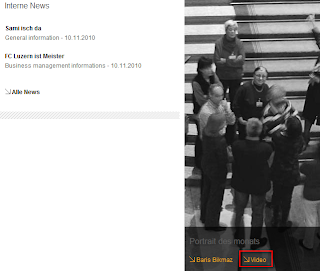 You want to place a link into your SharePoint site which opens the Silverlight player in a lightbox and plays a video from a asset library. 2.) Place a script tag for the mediaplayer library and a custom script tag for our custom js. You must place it after or in the onload event, because when you use getElementById the element must exist in the DOM. An error occurred binding content type '0x010100C568DB52D9D0A14D9B2FDCC96666E9F2007948130EC3DB064584E219954237AF3900...' to list '/ct2/Pages' on web 'http://pilatus/ct2'. Exception 'Object reference not set to an instance of an object.'. This exception occures when you try to bind an empty or non-existent content type to a list. An empty content type is a content type with no fields. Example of an empty content type. If you have a MatchPoint Composite oder DataGrid WebPart and you want to show data from a list which is from current month, from the last months or coming months you can use following condition(s). The field you check should be DateTime field. 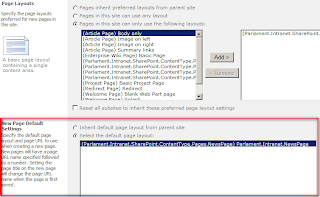 If you’ve ever developed a page for SharePoint 2007 you certainly used the EditModePanel control to control content visibility. This control now has changed in SP 2010 and ignores the Page Editmode. But there is a possibility to do this with no custom code. Locate the position of the class "s4-ribbonrow" and add a display style. (Or overwrite the class in your css). This will hide the panel in DisplayMode. Add following code after the ribbon div. This will show the ribbon in EditMode.